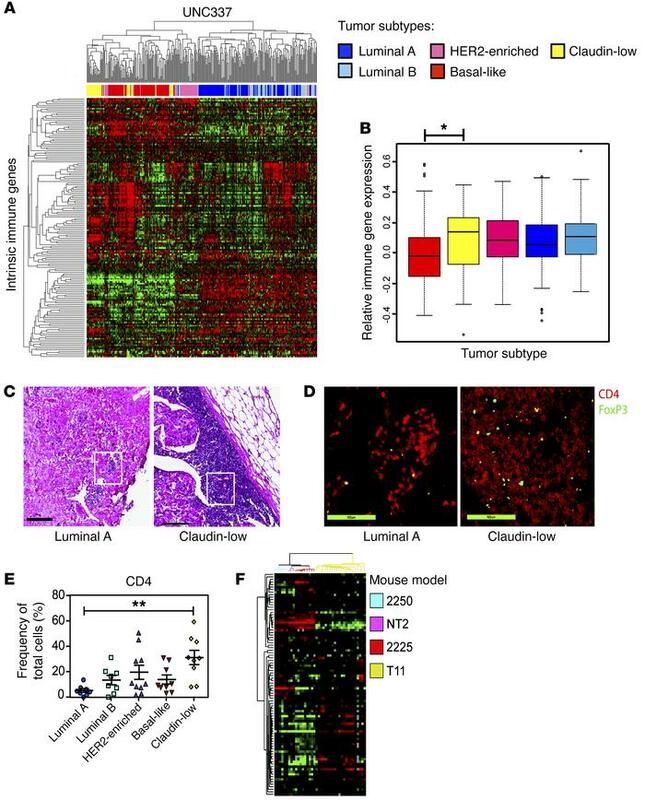 Human tumors exhibit differential immune gene expression. (A) Unsupervised hierarchical clustering of breast cancer samples from UNC337 by IIG list. (B) Overall expression of the immune gene signature by each subtype. (C) Representative H&E staining of human subtype–specific breast cancer. Original magnification, ×5. (D) Representative IF staining of human tumors for CD4 (red) and FoxP3 (green). Original magnification, ×20. (E) Whole-slide scoring of CD4+ infiltrate for each subtype. (F) Unsupervised clustering by the IIGs in GEMMs (n = 59). Statistical significance determined by Kruskal-Wallis test, with Dunn’s post-test for multiple comparisons. Data are presented as mean ± SEM. *P < 0.05; **P < 0.01.